The first bit of advice we can give you for this project is that it is far simpler and quicker of there are two of you than if you have to do it on your own. The reason for this is that you can't paint all the way round each spindle, or upright, from one side. As a consequence you are faced with either running up and down the stairs all the time, or you just work in synchronisation with a friend. 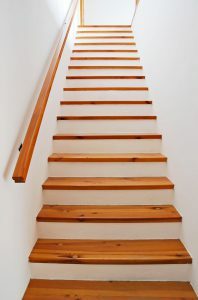 Depending on whether the staircase is made of softwood or hardwood, you have a variety of finish options. If it is softwood, you can either paint the staircase or varnish it. If the staircase is made of hardwood, then it would usually be either varnished or treated with a protective oil such as Danish oil. Remember that there are two sides to a staircase so it is not just the handrail, newel posts and spindles that need attention, the 'strings' or skirting on the opposite side need painting too. Additionally you need to decide whether the staircase is to be fully carpeted, given a central carpet with wood exposed at either side, or left as bare wood. Gloss or satinwood paint can be used, along with varnish and oil depending on the type of wood being used. If being painted, treat any knots in the wood with 'patent knotting' prior to applying one coat of primer, one undercoat and two top coats. If being varnished, apply a primer coat of varnish thinned down with 25% white spirit, followed by two coats of varnish. If using hardwood for the staircase, consider using a protective oil, such as Danish oil. Remember to gently sand down the woodwork after each coat has been applied, except the final coat. Sand down the surface to remove any loose or flaking paint or varnish, and to provide a key for any new paint or varnish being applied. Apply one undercoat and two topcoats if using paint – you can change gloss to satinwood paint and vice versa once undercoat has been applied. Apply one coat of varnish, or two if there are any completely bare areas of wood. Paint the spindles and newel posts, any exposed timber on the stair itself first. Check the spindles and newel posts two or three times in the first hour for any paint runs. Don't forget to paint the underside of the handrail. The paint the 'strings' on the other side of the staircase. Always paint the handrail last as you will be amazed how often you put your hand on it when painting everything else!